The following email interview with TEAW editors Jonathan Clode and John Stuart Clark was conducted by Anne Sommer and asks some strange but revealing questions. The two editors each took three of six questions, and answered them from a personal perspective. KA – Why do you think World War I is a key for the understanding of World War II / of the historical development that led to World War II? JSC – Neither of the co-editors are historians and we are not best placed to answer this question. Although all the stories are rooted in historical fact, only one, about the war in Nyasaland, is a dramatized documentary, included because few English-speaking readers will be aware the war extended into the East Africa colonies. When we started this comics project, the sum total of our knowledge about World War One would have barely filled a postcard, largely because, in our day (and possibly still), British schools taught a very simplistic and extremely jingoistic version of the conflict. As an adult, I came across the war poets, the BBC’s 26-episode Great War documentary series and the odd novel using the war as a backdrop, but all were completely Anglo-centric in their positioning. 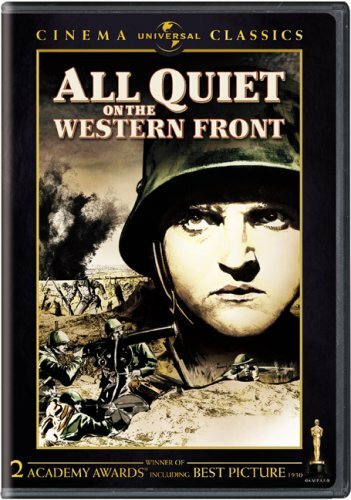 The only alternative or challenging cultural landmarks I encountered were Lewis Milestone’s All Quiet on the Western Front and Richard Attenborough’s limp interpretation of Joan Littlewood’s Oh, What a Lovely War! In Britain, it seemed, WW1 had somehow become lost in the deep shadow cast by WW2. I am old enough to remember being moved by the brilliant and controversial television drama The Monocled Mutineer by Alan Bleasdale, based on a history of the Étaples Mutiny, a rebellion the British government had tried its best to bury. The furor that followed transmission and the pressure applied by MPs to have it banned later encouraged me to seek out works such as Ernst Jünger’s harrowing Storm of Steel and Bernhard Wicki’s poignant Die Brücke, neither easy to source. 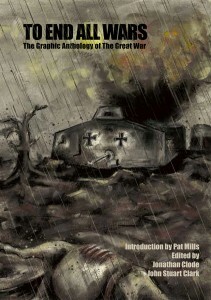 In this country, all I could find was Pat Mill’s superb comics series Charley’s War, which I devoured. As our researches for To End All Wars progressed, it became painfully evident that the truth of the conflict was a moveable feast. 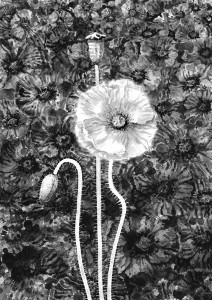 It seemed that not only were the events and insanities of WW1 still heavily censored or distorted in the UK, but that readily accessible imagery and official reports I took to be authentic were too often staged or fabricated. 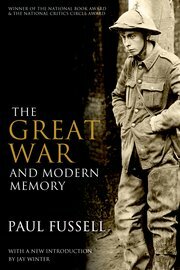 The one source I found trustworthy was Paul Fussell’s erudite study of The Great War and Modern Memory, which inspired a number of our stories. I appreciate this doesn’t answer your question but hopefully it explains why the focus of our book is primarily on the psychological impact of WW1 on participants and bystanders on both sides of the conflict. However, I do now have reasons to believe Britain cynically prolonged the war for purely economic reasons, regardless of the escalating death toll, and that our part in paving the way for the rise of National Socialism in Germany has been grossly understated. It is fitting that the final comics story in our book is about artist Otto Dix and set between the wars in a Weimar Republic he found as repugnant as Germany under the Kaiser. KA – On the website of your project you mention that one aim is to go against existing EU stereotypes. What political stereotypes about Germany/ German politics do exist in GB at present? Why do you think is it important to deal with World War I, if you want to put those stereotypes into question? JSC – After two World Wars, a hundred years of being envious of German engineering prowess and successive trouncings of the England football team, Germany and its people are this island’s favourite Devils in Europe. Screen performances by German speakers playing Nazis in English language war films have consigned the accent to the dustbin marked ‘Easy Laughs’, mined for such loathsome British TV comedies as ‘Allo, ‘Allo. Germans are horribly efficient, can’t get enough of rules and regulations, drink insipidly weak beer out of glass boots, love David Hasselhoff, all wear Lederhosen and, of course, have absolutely no sense of humour. The list goes on and feeds into a bitter distrust of Germany’s dominance and manouevring in the EU, invariably soliciting the response on the street of, “I thought we won the War!” Xenophobic British politicians fuel some of this, but things are changing, partly because the British are now exposed to revisionist German books, films and plays that condemn (or at least challenge) its recent history, and partly because so much that is great and German has been embraced, not least comedian Henning Wehn, who receives a lot of exposure on our radio and is funny! I’m not convinced a better understanding of WW1 would soften British prejudices against the Germans, although being better informed about German history, unification and the distrust between Saxons and Prussians would probably help. As far as we were concerned for the book, all prejudices were set aside right from the start. We had no interest in producing an Anglo-centric piece. Regardless of what side they were on, all combatants and their families left at home were to be treated as victims of mad, bad, corrupt and self-serving politicians and leaders of industry. Our very first story sets the tone by putting the principals in the build up to war on trial at The Hague. 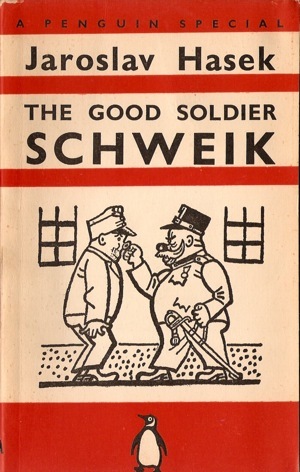 Their inquisitor is The Good Soldier Svejk. Certainly more stories from a British perspective are included, but all challenge received wisdom. We did not set out to make this an international anthology, but we equally were adamant that stories from the other side of No Man’s Land had to feature strongly and, yes, challenge stereotypes. 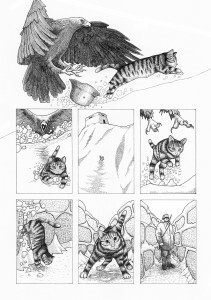 KA – Why did you choose comics as a medium for your project? What do comics have that other media do not have? JC – Quite simply, we chose comics because I’m a comic book writer, but I had a strong desire to see British comics have something to say about WWI. Over the years WWI has been a topic more readily covered in France by artists like Jacques Tardi, but there have only been a couple of English language comics that have dealt with the subject – Charley’s War by Pat Mills and Joe Colquhoun and White Death by Robbie Morrison and Charlie Adlard – so this was an opportunity to look at it with fresh eyes. Compiling an anthology allowed us to cover multiple subjects from numerous perspectives and create a wider picture of the conflict. 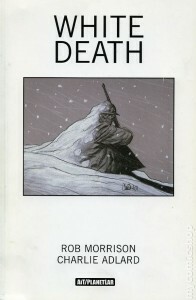 So often comics are dismissed as being incapable of tackling serious subject matter but they are one of the few means of artistic expression that doesn’t suffer from heavy censorship or the limitations of budgets and can often slip underneath the radar because they are dismissed as a medium for children. It also allowed us to present our stories in a variety of styles. 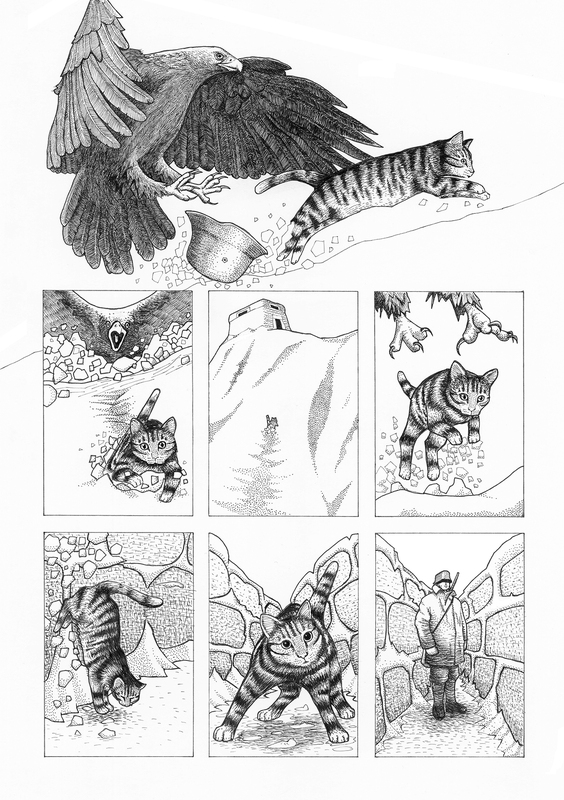 Among the more typical comic book narratives we have stories that are presented in a documentary style, we have a silent story told from the perspective of a cat, and we have a didactic story and a humorous take on life as POW. Using the anthology comic format also enabled us to utilise several genres. We have a horror story, a courtroom drama and a memoir, for example. Employing a number of storytelling tropes and genres enabled the creators to approach the stories from varying viewpoints, both light and dark, often posing as many questions as they answer and challenging the reader to consider the many moral and political assertions that now surround the event of The First World war. KA – How did you choose the artists and comics for the anthology? Are there only British artists? Are there German or French artists in the anthology? JC – Artists were chosen by in a variety of ways – some by invitation because we liked their work, but many approached us via social media and Internet forums. We had no particular criteria for our artists; rather we wanted contrasting styles that could do justice to the breadth of subject matter. 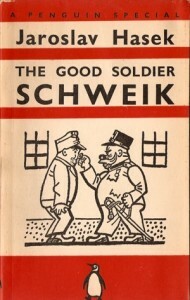 The artists were attached to stories based on their art, though some expressed a specific interest in wanting to draw a particular aspect of the war. Many of the contributors were new to comics, either having worked in other creative mediums, or being aspiring writers and artists who had not yet had an opportunity to develop. We were careful to treat everyone equally, never letting one’s status define their contribution. Rather our duty was to the subject matter and ensuring we represented the individuals affected by the war with integrity and truthfulness. Early on we knew that we wanted to present elements of the War that had been seldom covered in mainstream entertainment. We compiled a list of subjects that fascinated us and requested that writers who wanted to join the project craft stories around these ideas. We equally remained open to covering subjects that were of particular interest to the contributors. The majority of the stories were devised by the writers who we then paired with artists who we felt would best bring their scripts to life. We don’t have any French or German artists, perhaps because we used several British and American based internet forums to advertise the project, but we do have Croatian, Indonesian, Finnish, Spanish and American’s amongst 53 contributors spanning thirteen nationalities that have worked on the book, reflecting a global interest in commemorating WWI and making a statement about the horrific waste of life and self interest of the ruling classes that prolonged it. KA – Do the different comics in the anthology interact with each other? Is there a topic or motif that they share? JC – While the comics are not part of the same story, they interact by sharing themes and referencing key events in the war. Though not directly linked, mentioning a battle or an individual that we’ve seen in a previous story helps the reader see that this was a true World War. The Coward’s War deals with the early battles of the war and the spectre of execution that hung over frightened soldiers. The aftermath of these battles and the fear of being shot at dawn comes up again in The Angel and the Hound, as soldiers prepare to face the gravest battle of the war and reflect upon their experiences to that point. Kapitan Fritz’s Daytrip to Yarmouth introduces readers to the first zeppelin attacks on the UK, and The Stainless Steel Elephant picks this up towards the end of the war when the British public were more accustomed to such attacks. The Stainless Steel Elephant also provides an insight into the affections animals spurred from war weary soldiers and civilians. This theme is further explored in Il Gatto, but with very different consequences. The book looks to give the First World War a very human face, and present some of the more unfamiliar aspects. The over-arching thread is that this war was ultimately a disaster for the people who fought it, but was a triumph for the winning politicians and for the captains of industry on both sides. Our book looks at the effect it had upon individuals, society and the world at large, but from as many vantage points as we could portray. Unlike many other representations of WWI, we sought to depict if from both sides, dismissing the idea of ‘the enemy’ and giving a voice to all combatants and their families. There were certain subjects we very much wanted to cover such as Sikhs fighting for the British, the inventor of mustard gas and conscientious objection, but ultimately were unable to fit everything into a single volume. KA – How important are personal experiences of the artists (e.g. travelling through Flanders)? JSC – We can’t speak for our contributors, except to say that all passionately wanted to make a statement about the utter futility, waste and madness of the so-called ‘Great War’. They have donated their creativity and hard work for free, and are delighted that profits from the book are going to Medicine Sans Frontières. Some might have visited Flanders Fields, a pilgrimage I know greatly moved my co-editor, Jonathan Clode, a Welshman who was truly humbled by the Flanders Fields Museum and Welch Regiment cemetery. For myself, I not only spent much of my youth in war zones but, with Austrian and Scottish parents, I bridge the divide. While my British family survived both World Wars, the men on my mother’s side were largely wiped out in WW2, either at the Russian Front or by the Gestapo. My grandparents fled the Nazis and landed up in a British concentration camp. My father’s godfather was Earl Haig, architect of what many in this country call the mass murder at the Western Front, and his closest friend after the war was a Luftwaffe pilot. I was Christened ‘Hans’ and, as a child, had the pronounced high cheekbones that set me apart as a foreigner. When I entered an English boarding school in the Fifties, I was labeled a Nazi and regularly beat up (the British still aren’t good at distinguishing an Austrian from a German, and I quickly changed my name to John!). Such things leave deep scars. On the other hand, spending so much of my childhood in trouble zones in foreign countries, playing with local children, instilled a belief that ‘folks are folks’ the world over, regardless of colour, race or creed. 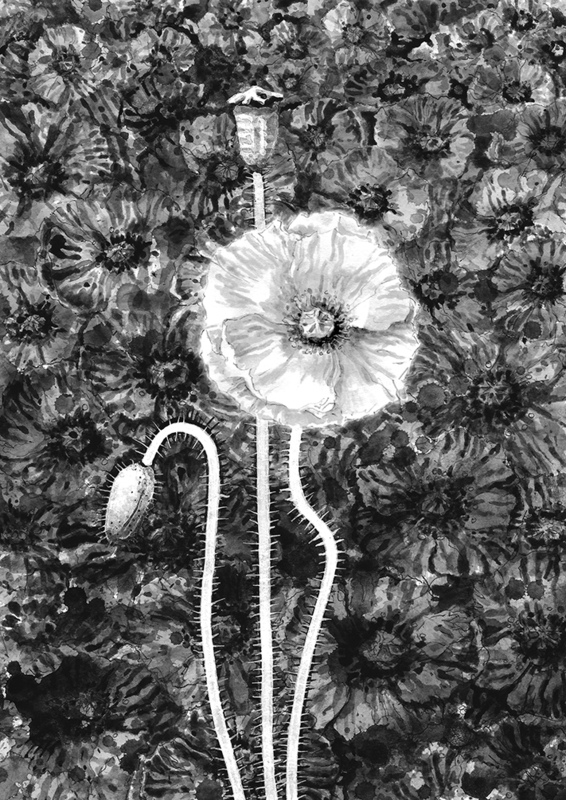 It was perhaps inevitable I would become a political cartoonist, but my desire to be a lynchpin in seeing To End All Wars come to fruition was mostly from a deep distrust that the British government would change their spots and honour the centenary commemorations with anything but more jingoistic nonsense. Sadly the recent outspoken declarations of Education Secretary, Michael Gove, have proved me right.